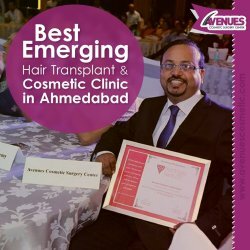 Dr. Kinnar Kapadia is a Board Certified and an experienced plastic and cosmetic surgeon and Hair Specialist in Ahmedabad. Our aim is to provide maximum hair growth for each individual who is associated with us. Our clinic looks after men and women with all ages suffering from baldnessWe routinely use the GIGA sessions (> 3000 grafts per sitting) and make use of us FOA approved SAFE system.